In the Army of the Tennessee, there was fierce skirmishing around the slopes of Big and Little Kennesaw during the fighting on June 27, 1864, as well as in the days afterward. Here, Colonel Oscar Jackson provides some thoughts on the battle and the skirmishing in which his regiment was engaged. Have orders to stand to arms at 8 am, with sixty rounds of ammunition and canteens filled. 900 am There has been heavy cannonading all along the line and it is said we are going to assault the enemy’s works. Later. Heavy musketry to our right and we are trying to advance our skirmish or first line up the rugged sides of the mountain. Sunset. All is quiet. We succeeded in advancing our line with considerable loss, mostly in the 64th Illinois. The result of the fighting on our right, where it was heavy, is unknown. As the results of our assault yesterday we have General Harker killed and long lists of killed and wounded from every attacking column. We inflicted considerable loss on the enemy, took quite a number of prisoners and occupied considerable of the enemy’s works, but I am of the opinion not sufficient to repay our losses. Our immediate line is advanced far up the mountain to a point gained by considerable loss of life and now very difficult to hold and no apparent gain when it is held. “Our only shelter is in the niches of the huge rocks which cover the sides of the mountain. The enemy know just where we are, but we are ignorant of their position, and they are bouncing the balls on the rocks around us quite lively. “Marietta, Georgia, which fell into our possession on the occupation of Kennesaw Mountain is considerable of a city and makes good hospitals and depot buildings. Two miles northeast Kennesaw Mountain stands a wonderful natural curiosity, called after a Cherokee Indian chief who was killed on it. It rises very abruptly. Its sides are rocky and difficult of ascent without opposition. The view from it surpasses anything I ever saw before. The vision with the naked eye extends from fifteen to thirty miles each way. Our works and the theater of operations of both armies are spread out below like a map. The enemy had but few works on the mountain but it must have been invaluable to them as a signal station. It looks as though they might almost have counted our men. I cut a block from the lone hickory on the top of the mountain, a tree that shows very plainly from below and I dare say will long be remembered by every member of the army that fought at this memorable place. While I haven’t published much on here over the last few months, it has been with good reason. I have been working on a new project over the last year and a half, one which is finally finished. Just last week, my second book was published, this one taking a look at the Civil War career of our 20th President, James Abram Garfield. 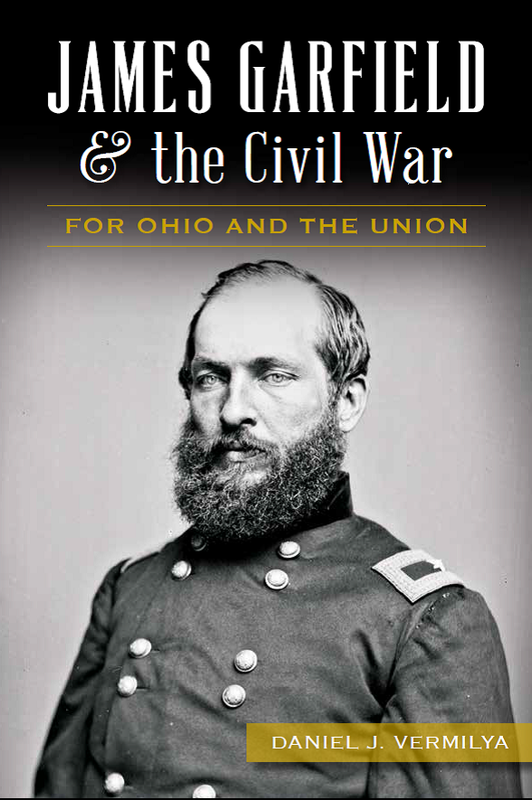 Published by the History Press, James Garfield and the Civil War tells the story of how James Garfield served in the Union army during some of the most pivotal years in American history. I am glad to say it is now available! If you would like to purchase a copy, you can do so through Amazon or Barnes and Noble. If you would like a personalized copy, send me a message through the Contact Me page (under the About Me header). While this book doesn’t deal with the Battle of Kennesaw Mountain, it does deal with one of the more interesting and overlooked figures of the Civil War in the West and the Army of the Cumberland. Garfield had left the army for Congress by the time of Kennesaw Mountain, but he had played an important role as the Chief of Staff for the Army of the Cumberland at Chickamauga just nine months before.